← Lahore: Cultural capital to Taliban territory? One of the greatest sons of Punjab in the second half of 19th century Sardar Dyal Singh Majithia was a versatile and amazing personality. His father General Lehna Singh Majithia was one of the Generals in Ranjit Singh’s army, who was an engineer and Chief of the Ordinance department of the Maharaja. For three generations the family had provided generals to the maharaja’s Army. Majithia Sardars family was so eminent that when Viceregal Durbar was held in Lahore in 1864, of the 603 people invited, Dyal Singh then age 16 was allotted 55th seat and his uncle Sardar Ranjodh Singh Majithia being 103rd. Anarchist situations that prevailed in Punjab after the death of Maharaja Ranjit Singh in 1839, forced General Lehna Singh Majithia to leave Lahore. After travelling Hardwar, Banaras, Jagannath Puri and Calcutta the family settled down in Banaras, where Dyal Singh his only son was born in 1848. Orphaned at the age of six on the death of his parents in 1854, Dyal Singh was brought to his ancestral home Majitha- a town 10 miles north of Amritsar in Punjab. Dyal Singh received education first at home, from an English governess and then in the Christian Mission School at Amritsar. Dyal Singh showed signs of an inquisitive mind with an insatiable hunger for knowledge. He became a scholar of Persian, Arabic, Hindi and English. Sardar Dyal Singh later shifted to Lahore. His friends were teachers, poets, lawyers, civil servants and politicians. Dyal Singh lived like a prince. He was a patron of wrestling and keen kite- flyer. He travelled to the United Kingdom and Europe, which broadened his outlook towards life and revolutionized his religious beliefs. Sardar Dyal Singh developed an admiration for western system of education and the freedom of the press. He started the weekly Tribune- newspaper from Lahore on February 2, 1881. It became tri-weekly in 1898 and a daily in 1906. 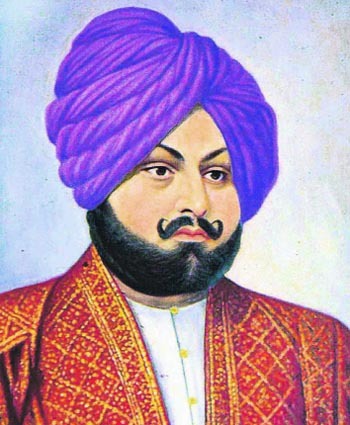 Sardar Dyal Singh was the main force behind the founding of Punjab University Lahore. He was the leader of Punjabi youth in the movement for demanding in setting up a University in Lahore to impart education through the medium of English. The battle was won in 1882 when the Punjab University was set up on the model of Calcutta, Bombay and madras Universities. According to Annie Besant Sardar Dyal Singh was among the “17 good men and true” who founded Indian National Congress. Unlike other Jagirdar Sardars of his time, he took up the business in real estate, diamonds and jewellery. He earned quite a fortune from the business and utilized his self earned wealth by helping the needy. Throughout his life Dyal Singh gave scholarships to deserving students of all communities. He held 25 percent of the initial shares in Punjab National Bank until his death and was the Chairman of Board of Directors. He was the first President of Indian Association of Lahore and continued in that capacity till his death. Sardar Dyal Singh Majithia Died on September 9, 1898 without an issue. After the partition of the country in 1947, Dyal Singh College, Dyal Singh Majithia Hall, Dyal Singh Mansions and Dyal Singh Library still exists by the same name, it is a tribute to Sardar Dyal Singh’s transcendent qualities that Pakistan Government retained his name for the college and library. The Tribune shifted to Simla then to Ambala and later to Chandigarh. The properties in India were taken over by the Sardar Dyal Singh College Trust which runs Dyal Singh College in Karnal. The Sardar founded these trusts with great care. His trustees were well chosen, and they have tried to keep his inspiring philosophy alive. Even Partition has not killed the trusts. They are still alive. Sardar Dyal Singh lives on. He still inspires. This entry was posted in Civic, heritage, History and tagged Dyal, India, Lahore, Pakistan, Partition, Sardar, Singh. Bookmark the permalink. Good piece of information.Just to add few more words,Dyal Singh Building on The Mall,in Lahore was constructed in 1930.It was basically designed to cater the business families.It had luxury shops on the ground floor and appartments on the top for business people.This dyal singh comples was a world of its own.It had its own power house on the back and its own water provision system.There was play area on the back with servant quatters.This was uptill 1947.No doubt a specimen of fine architexture and superb worksmanship.It was a jewel in the crown of lahore. Fast forward 2008.This biulding is decaying and in very bad shape.Apart from the front fascade,the rest is crumbling down,thanks to THE ETB,Evacue Trust Board Govt. Of Pak. On entering the beautiful roman arch,you enter a area of workshops,denters painters trying to fix all kind of cars.This was the place where once lush green lawns stood is a miserable lot now with qabza groups and land grabbers trying their best to grab as much land as possible.Power house and water system all gone,once the well known Shezan whose food was the best available has been burnt down,thanks to our emotions.Big cracks in the manin structure of the building,just waiting for its end. All lahoris should think how to preseve these jewels of Lahore,as its equivalent to preserving ourselves. The Majithia’s properties were taken over by the Evacuee Trust Property Board after Partition. The ETPB now manages what remains of the evacuee pool: non-Muslim religious trusts and properties reserved for religious purposes. Because of the religious nature of the properties managed by the ETPB, it falls under the administration of the Ministry for Minorities, which is part of the Ministry of Religious Affairs. So when the Ministry of Religious Affairs needs property for, say, accomodating Hajj pilgrims, it has a ready pool of properties available to it through the ETPB. Hence the Diyal Singh Majithia Hall on Queen’s Road is now used Hajj pilgrims and why the Diyal Singh Library is under the control of the Ministry of Religious Affairs. The ETPB also has rent restriction in operation on its properties. Our rent restriction laws means that rent is always below market rate, which means landlords like the ETPB tend to profit maximize by cutting down on maintenance expenditure. That’s why so many ETPB properties are in disrepair. Thanx 4 bringing this post to us. Its really a wonderful piece of info on that great son of Lahore who being a Sikh might not be recognised that much by us but his works speak what he was to Lahore. All of us who live in Lahore, owe a great deal to this true son of this culrural metropolis of Pakistan. I got enough information. S. dyal sigh majithia is mine, as Majitha is 5km away from my village Bhangwan on lahore branch canal.My village also falls on railway line from Amritsar to Majitha,Kotlagujran, Fathegarh Churian,Ramdas and Dehra Baba Nank. I, in my school age use to travel along the railway line from the village to Majitha school adjoining to Majitha Railway Station. On the way, half km in the north from railway line there were remnants of the kila of Sardar Dyal Singh. It was surrounded by water canal called “hassari” In front of it there were huge mango gardens and that is why Majitha was called BAGAN WALA MAJITHA” It was having bara dari and huge tank for bath of ranies.Our farming land at village Bhangwan has a common boundary with Sardar Dyal Singh Majitha”s land.It is legendary talk in our house that Sardar Lehana singh got land as much as he wanted by moving the horse. BUT our grand -grand father who was ill, he got carried his cart at that place. When hourse reached there ,Sardar Lehna Singh left our land by seeing the affections with our grand grand father. Later all these lands were occupied by Parkash Singh Majithia and his two brothers.I use to see this killa from railway line daily when I use to pass to school and back to village as it use to creat an awsome scene for me. But I am sorry to say that trust has not made any thing at Majitha. at least an Engineering College, Medical college and a general collge must be installed at majitha as it is a very backward area. Majitha famlies have done nothing for Majitha in the last 100years. The information about this son of Lahore very interesting. Thank you. I am a Lahori and have lots of love for Lahore. The state of affairs that you mentioned about Dyal Singh Mansion are indeed correct and it is shameful that Evacuee Trust Property Board is not doing its duty. Those workshops at the back of the building, is a disgraceful use of the land. I simply wish someone in authority get it vacated and restore to the green area as it was prior to 1947 . Wonderful and a lovely human being. I believe there is and there was no religious boundaries for great men. Men like Diyal Singh deservey appreciation beyond boundaries and sects. Furthermore we must work on common heroes and their contributions to humanity. Highly greatful to the writer for lifting candle of enlightenment of the past.